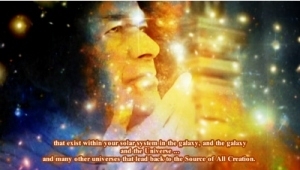 We are calling upon Cosmic Sai Baba to make his presence on this day, 6th of May 2014, and it is also the day of Enlightenment of the Buddha … which is also celebrated as his Birth Day. ❝ I am here! And I am very pleased to be here. In fact, I have been here all the time. Listening! And with great interest. I have said before, that we float thought forms in and around you and so many of the thoughts that you have had actually float into your mind and if you accept them, they become yours, you understand. So we are not interfering with any – shall we say – with any karmic roots within you. We are assisting. And we have been assisting mankind – humankind, ever since they began here on this planet Earth. There has been quite an evolvement and transition with the human – and now … now I can say … that finally you are moving into a dimension where you will find it easier to understand your own Self and your own consciousness. And who you really are. And from there of course you can work and help to create what is meant to be upon this Earth. Which has been called the Garden of Eden. I have said before that Eden is a sound, a vibration, and this is at the level of what the … images and creation … will take place. And I mention this because there is talk about music and colour … and sound of course, is both. So that the vibration from that will help with creation. And this will make it much easier in your lives if you – take it into you the ability of feeling the vibration – that comes from the colour and the sound. And you will be able to move forward. And make your life very easy; very easy indeed. For your consciousness will match that vibration. And that vibration itself holds what is needed for each and every individual soul upon this Earth. For I would like you to think about this. I will not speak too long today, for I want you to understand and know that you are moving forward into the Golden Age. And this is a most important transition! For, if you feel that you are confused or unhappy or worried, ask for the Creator of All to help you to release this energy – for it will be easily released I can assure you – and from there you can move forward. And you will be as we all want to be, wherever WE are—whichever universe WE live—and that is free! You have freedom of choice. You have freedom of will. And so it is up to you to work with yourselves … to free yourselves … and the energies are all around you, to help you … to take that place. Thank you my children. Thank you. But before I go, I will bless these beautiful people that have sent me emails … And words of gratitude, along with their concerns and worries. And I want to reassure them, that I am with them always for when they reach out to me, I am there. So please, accept that, please trust that. I love you all. And I have promised I will never leave you—once you have reached out to Me—I will never leave you. Remember that, remember that, remember that.